I am pleased to announce that Microsoft Australia is planning a new training and certification campaign, Ready, Cert, Go which I will be involved with. To start off with there will be complimentary 60 minute instructor lead tutorial webcasts in November which will cover the topic to be offered in full day exam prep courses in December 2013 at Microsoft in Sydney. Even though I am giving the Office 365 content I have signed up myself for the SharePoint and Lync sessions as I see this as a great opportunity to not only learn about the product but also hopefully pass the certification. I’d love to do the Windows 8 and Azure sessions as well, alas, not to be this time. I hope to see you there at the webinar or on the day. I am proud to announce the completion of another Office 365 book. This one is titled Getting Started With SharePoint Online 2013 for Enterprises and is the longest book I have written to date at 275 pages! along with all my other works. You can also view the table of contents to get a better idea of what the book contains. the ePub and Kindle version will be available soon from my publications page as well as other book resellers. If you are reader of this blog you’ll know what a big advocate I am for OneNote. 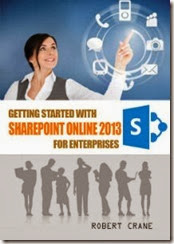 Coupled with SkyDrive or SharePoint Online it is really the premier collaboration solution out there. if you haven’t used it then you really should. With that in mind here are three new videos demonstrating what OneNote can do for a variety of people. OneNote, use it. You won’t regret it! I am happy to give you the opportunity to jump on board with a new venture my partners and I are working hard on – Cloud Business Blueprint. At this point I can’t reveal too much only that it will the culmination of many things I have been working on recently, but now all together under a single banner. The site will provide a range of resources to assist IT Professionals and resellers better manage and take advantage of the opportunities that cloud business affords. It will be more than simply technical information, it is aimed at providing a complete range of resources, information, training and support on a variety of technical and business topics. There is no obligation when you register, you are just letting us know that you wish to be informed (and take advantage of our start up offer) about what we are bringing to market and some opportunities we believe you will be interested in. Whether you act on these opportunities when they become available is totally up to you. If you are interested at all I encourage you to sign up and be the first to advantage of what we will be announcing in the very near future. More information about what we have planned will be revealed very soon, so watch this space. 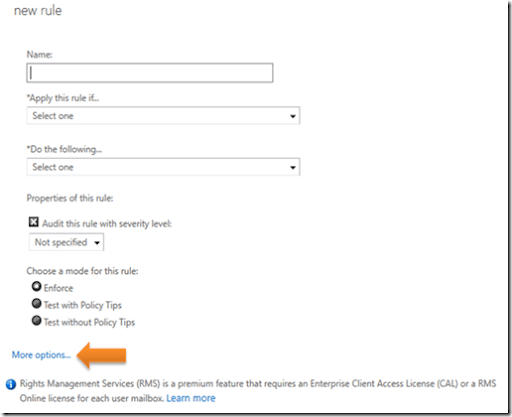 So here’s another quick walk through of a very common request in Office 365. How do you ensure all emails from a certain domain are never treated as spam? 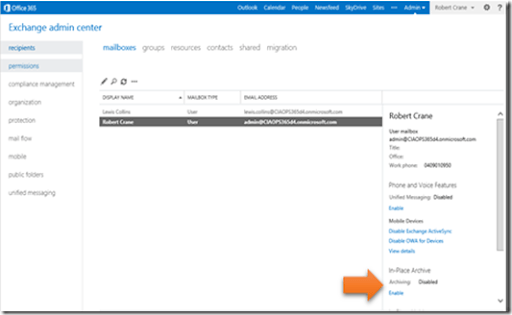 Firstly, login to the Office 365 console as an administrator. Select the Admin menu item in the top right of the window. From the menu that appears select Exchange. That will take you to the Exchange admin center. From the menu on the left select mail flow. Select the + icon and then Create a new rule from the menu that appears. This is the step that many miss, select the More options link towards the bottom of the window. 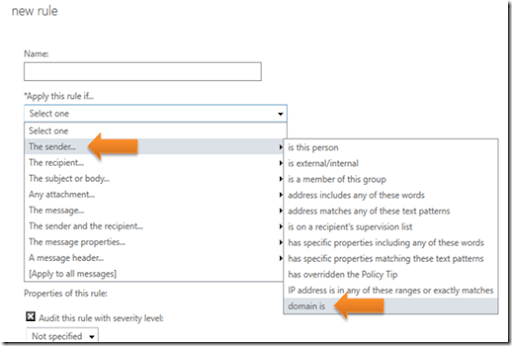 Then, in the Apply this rule if option box pull down the options and select The sender and then domain is. Enter the domain you want to have excluded (e.g. alwaysallow.com) and press the + key to add and then ok to save this. 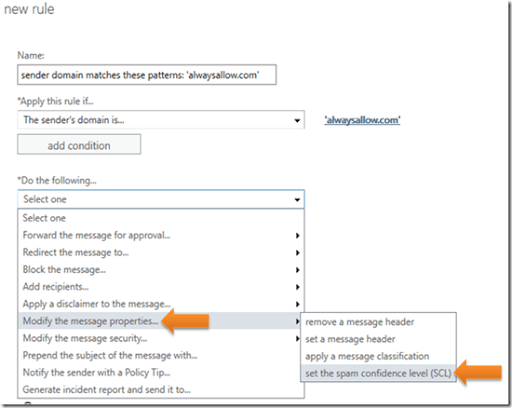 In the Do the following option box pull down the options and select Modify the message properties and then set the spam confidence level (SCL). 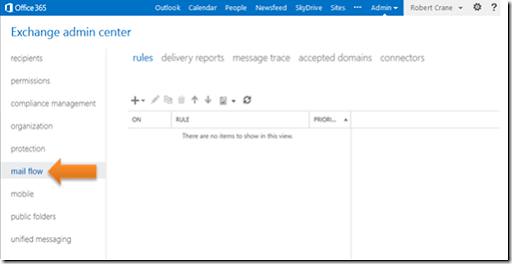 Change the specify SCL to Bypass spam filtering via the pull down options. Press the ok button to save. If you scroll down you will see a number of additional options you can set before saving this new rule if desired. I think that perhaps the term ‘hate’ is a little emotive but that is what much of the media portrays the reaction to Windows 8 as. I’ll try and take a pragmatic view to why I believe many are having such strong reactions. The first point I believe is that the major issue for most people is the new ‘fluid’ or tiled interface (that was once known as metro). Thus, I’m going therefore focus on this and assume that most of the other parts people can live with. So why does the new ‘tiled’ interface cause so much angst? I reckon because there is no bridge for users to bring their accumulated knowledge forward. Let me start with an analogy. Imagine that you came into work one day and found that not only had your desk been relocated, but everything on the desk had been moved inside cabinets. Also imagine that you where no longer located near your previous work colleagues and worst of all no one assisted you make this transition. You’d probably really struggle to settle into your routine and get work done wouldn’t you? You’d also get pretty annoyed about these changes being something outside your control. So let’s now reframe that in the Windows context. The Windows 7 interface many people are using today is now actually over 20 years old. If you stop and think about it, you need to go back to Windows 3.X to find a major interface difference. The old Start button has been with us since Windows 95 days, almost 20 years! If the interface change from Windows 3.X to Windows 95 was the last major look and feel that Windows underwent you’ll still find some commonality that was brought forward. Things like the desktop, wallpaper, maximizing and closing windows in the top right corner, icons, etc remained essentially the same. Such items provided a bridge for users to make them more comfortable with being able to bring some of their accumulated knowledge forward. Because of this they were much more willing to learn new features. So even though there was major interface changes, there was still enough things that didn’t change to assist people moving forward. Now fast forward 20 years to the next major interface change Windows 8. In short, Windows 8 has been too ambitious in what it has tried to do. When an existing user boots Windows 8 they no longer really see anything familiar. This immediately creates a sense of panic. Also unfortunately, Windows 8 has not provided an easy path to help users acclimatize to the new operating system. This is where my previous post on training was relevant as well. What do I mean? As an example let’s take a look at the standard desktop wallpaper. Many users like to customize this with pictures of family, pets, vacations, dreams, etc. Having such familiar objects helps them personalize their machine and develop a sense of ownership since they can make the changes themselves. Problem is with the new titled screen in Windows 8 you can’t easily change the background. You also can’t easily have a familiar wallpaper here. In short you are stuck with what Microsoft dictates, you don’t have the control you used to. The same arguments applies to the colours and theme, again something that many people like to customize, to feel a sense of ownership and familiarity. Another example is that previously in Windows 7 everything you worked on was available on the one screen. I could see all the desktop icons or access the programs via the Start menu. With the new tiled interface you need to scroll to the right to see things. Obviously that is something copied from devices like the iPad but when you come from a legacy environment like Windows, subjecting this to users so dramatically will cause problems. It is successful on an iPad because that’s the way it has always been on an iPad. If Apple ever attempt to change that they’ll face the same challenges Microsoft currently does. Next example is the app duality. This means you have apps that run on the tiled interface and different apps that run on the desktop. A good is example is viewing pictures. If I run Outlook on the desktop and open an image from an email, by default it launches the titled interface app to view that image. Now how do I get back to Outlook? Once you know that hitting the Windows key or dragging from the top of the screen down does the job BUT my point is people don’t know this initially and the product doesn’t provide any hints on what you need to do. There again is a sense of a loss of control which leads to frustration. To my way of thinking it would have been a very logical idea to include the familiar close X button in the top right of the tilted program as an additional method of closing the app. That way, most people would probably try looking there to close the app. Thus, add all the new features but keep some of the old ones that people are familiar with as an transition. Next, by making all the titled apps run in full screen mode it not only creates a lot of wasted space but hides everything you are doing. Even if you maximize Windows 7 apps you generally still retain the bar at the bottom of the screen along with the Start button in the bottom left. In Windows 8 all you get is a full screen app. This again creates a sense of the loss of control and frustration when it comes to navigation. I’m sure there are plenty of others people have frustration with but I hope you see my point that unfortunately Microsoft has neglected to retain some key features of the interface to provide people with a bridge into this new world. There is no doubt that Windows 8 is a better option than Windows 7, especially in the long run, however if people have major frustrations when they first start using something they are going to turn against it as they have. Unfortunately for Microsoft they are constrained by the legacy of their existing successful software which limits their ability to bring true innovation to the market, which unfortunately is something they get roundly criticized for. They have certainly tried to make this jump with Windows 8 and as expected they have copped backlash. Perhaps they have been too bold? Perhaps users are too conservative? Over time we will no doubt reach the happy medium everyone is looking for, but it will be a bit bumpy along the way as both Microsoft and users insist that they shouldn’t have to change. Both have valid reasons both need to compromise to move forward. As I have noted, I think that a few minor inclusions in Windows 8 to allow a bridge between the old and new interface is what would be the best option, however I am yet to see them. Microsoft has attempted a really innovative change to its flagship product in order to align with the coming changes in technology. Problem is the sheer legacy of its previous successful software has meant such a radical change is no longer without major risk simply because, thanks to human nature, people prefer things to stay the way they are. The only way to move them forward is to provide a familiar bridge so that they have early successes and have confidence to explore new features and functionality. Balancing how big this bridge is with the need to innovate is a challenge that is not always achieved at the first attempt. 2. By default, on all plans, the in-place email archive is disabled for all users. An administrator must enable it before it can be accessed. 3. 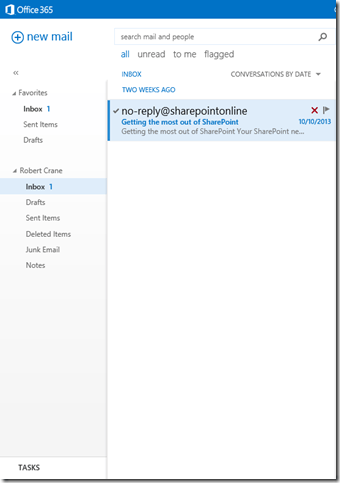 The in-place email archive contents are stored ONLY in the cloud. They are never synced to a desktop like the Inbox is. 5. Plans that include Exchange Online Plan 2 (E3, E4) have an unlimited archive. Plans that have Exchange Online Plan 1 (P1, P2, M, E1) have a limit of 50GB of storage between the Inbox and the Archive. For example, in Exchange Online Plan 1 you could have a 25GB Inbox and a 25GB Archive, or a 10GB Inbox and 40GB archive. 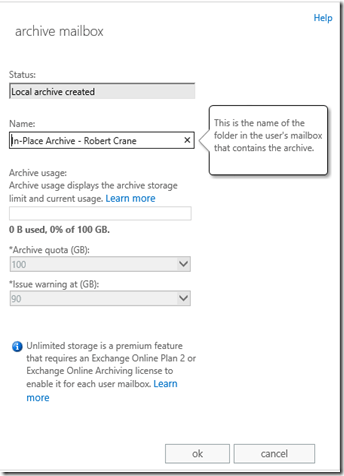 With Exchange Plan 1 the total size of the Inbox combined with the in-place archive cannot exceed 50GB. 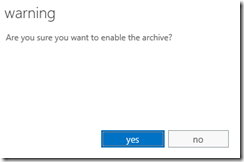 This is the process you need to enable the in-place archive via the portal. You can see that the above mailbox only currently has an Inbox and no archive. 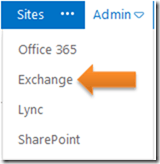 First step is to login to the Office 365 portal as an administrator and select Admin in the top right corner of the window. From the menu that appears select Exchange. 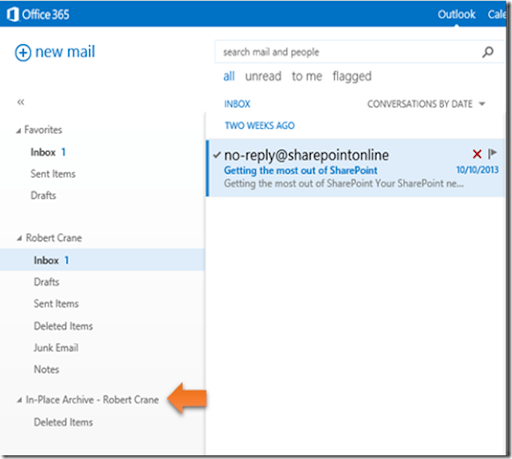 Select the mailbox you wish to enable the in-place email archive. From the information in the right hand side panel select Enable under the In-Place Archive heading. After a few minutes (the process is not instantaneous) a new folder will appear in your Outlook (web and on the desktop) called In-Place Archive – as shown above. The archive is now ready to use. 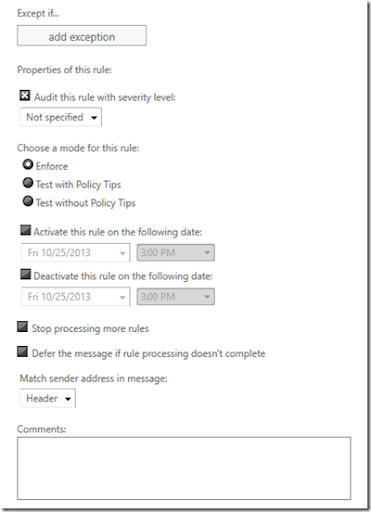 Users can drag and drop items in there and email policies (user and organizational) can now utilize that folder. 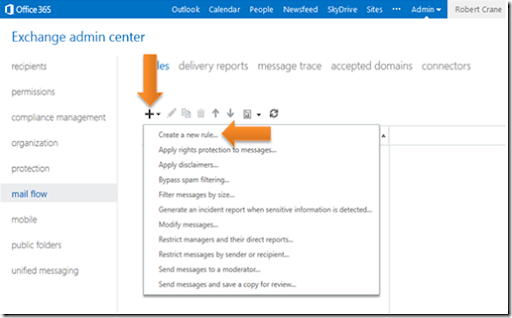 As an administrator, if you again look at the mailbox, under in-place archive you will see an option Details. Selecting that will show you a window like that shown above providing details of the mailbox. Remember, this options vary depending on the Exchange Online plan the mailbox is subscribed for. I see a lot (and I mean a lot) of angst about upgrading to Windows 8. Some even take it as a personal affront that Microsoft has personally targeted them and made their next PC upgrade experience poor. What really amazes me the most is the total lack of logic and pragmatism when it comes to any upgrade these days. Technology is developed by humans, therefore it is never ‘prefect’. Adapt and deal with it. Look for the positive rather than dwelling on the negatives all the time. Further than that, I would suggest that I have never seen more self-absorbance from all sides in this debate. So let’s get one thing straight right up front. Technology changes. We went from DOS to Windows 95 and the world didn’t end. We went from Windows 2000 to Windows XP and the world didn’t end. An so on and so on. The big difference now is because technology is so ingrained in society, changes affect so many more people. The other major difference is the voracious appetite of the media in the quest for eyeballs. Bad news attracts a lot more readers than good news now doesn’t it? Sensationalism and emotion are the aim these days with the media. Why? It is not about necessarily reporting fact, it is about getting eyeballs for the advertising dollar. Thus, poetic license and exaggeration have become the accepted tools to enamour this, with none more prevalent than in the technology industry. This approach by the media places many technology companies, like Microsoft, constantly under siege. This directly impacts the way they conduct business and how they deal with external parties. They need to work harder to overcome the exaggerations and innuendos that are so much part of the media reporting we see every day. Unfortunately, dealing with this simply reinforces the initial media portrayals and the whole thing becomes a non stop downward spiral where everyone loses out. So let’s return to the Windows 8 upgrade question and some of my own personal experience with a family member who I upgraded from a Windows XP to Windows 8 machine recently. Prior to the upgrade there was significant trepidation by the user about moving to Windows 8 simple because of the ‘perceived’ issues. Now a few months after the upgrade what is the result? A very positive and happy end user. How was this achieved? What was the magic formula? In a word – training. Once the new Windows 8 machine arrived and was set up I spent not more than 10 minutes showing the user how to do their old stuff and some of the great new features. That gave them the confidence to at least start using the device. When I returned a few days later to resolve any further issues I found that the user had already downloaded a number of games from the Windows 8 store and was happy playing them, all by themselves. Sure, there are still a few issues and frustrations now and then, but that happens with ANY technology. The main point is that by providing some initial training at the commencement the user had the confidence to at least start. This to me is what is missing with technology these days. Training! Too many suppliers, resellers, providers, bosses, employers, organizations simply EXPECT their users to know all this new stuff. The assumption is that they use technology everyday themselves so why should the business waste time and money on training? Wrong, wrong and wrong. If a user is afraid or unsure about using something, they won’t. As they struggle they will become more and more frustrated and blame the technology rather than their lack of knowledge. This then reinforces all the ‘negative’ things they have heard from other untrained users. As I said earlier, technology is about change. Thus, if you use technology you also need to change. This means you need training. Whether you do that yourself freely from Internet resources or pay, it doesn’t matter. If you use technology you need to have constant training because things never stay the same. Most people don’t need hours and hours of intense deep dive training they simply need a bridge between what they already know and what is offered by the new technology. Some people are happy to develop this bridge themselves, most need assistance but look around, where do the majority of people get this bridge from? It is generally never provided so they struggle and without such a technology bridge they will never traverse to understand the new technology. In summary, I would say – technology is about change, get used to it. Companies that sell technology are businesses, they are in this to make money and they need to be looking 3 – 5 years down the track to provide return for their shareholders. What might seem bad today can morph into the fantastic down the track. To improve technology adoption there needs to be better and easier training provided. Most importantly businesses and individuals need to be WILLING to invest (time and money) in training to make the most of what technology provides. They need to willing to be constantly making this investment in training, because you know what? Technology waits for no person!